42 Rules for Your New Leadership Role offers practical and effective actions for you to start strong at your new VP, Director, or Manager job. Let this book remind you what you did right before, help you avoid common missteps, and give you new strategies for acing those critical first months. Buy this book when you’re making a step up, moving to a new organization, or for your friends as they move up. This book is also an ideal reference for executive coaches, mentors, HR business partners, management trainers, and others who help new leaders be successful. 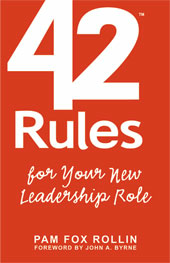 42 Rules for Your New Leadership Role describes practical and effective actions for you to make a strong start at your new VP, Director, or Manager job. Drawing from extensive interviews with corporate leaders and the author's 20 years as a strategy consultant and executive coach, these rules form the manual they forgot to hand you when you got that promotion or offer letter. Topics include how to gain cooperation from your team, read the business culture at your new level, tee up smart "quick wins", show others how to work with you, assess the business risks in your new role, make the most of your strengths without overdoing it, work around your weaknesses, use team screw-ups to your advantage, redesign your undoable job, and stay focused on your plan when everyone wants you to fight fires and solve the problems on their desks. Pam gives you specific guidance for each step of those first few critical months. 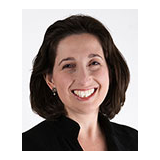 Her recommendations are shaped by current and classic leadership research, as well as fresh insight from her interviews with executives and surveys of leaders at all levels. With her background as executive coach to top Silicon Valley companies, corporate strategist with Bain and Accenture, and Guest Fellow at Stanford GSB's Center for Leadership Development and Research, Pam translates the experiences of thousands of leaders into easy-to-read guidance. Let this book remind you what you did right before, help you avoid common missteps that cause leaders to stumble, and give you new strategies for acing those critical first months. Adjust what you find here to serve team needs, market condition, cultural context, your goals and your personal leadership style. Buy this book when you're making a step up, moving to a new organization, or for your friends as they move up. This book is also an ideal reference for executive coaches, HR business partners, management trainers, executive assistants, and others who help new leaders be successful.